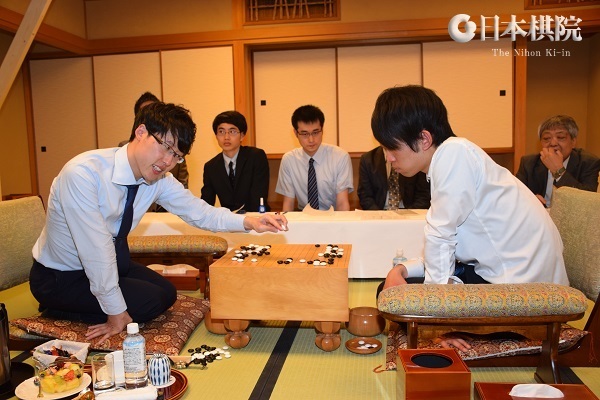 Iyama makes good start in Honinbo defense: Iyama Yuta, or Honinbo Monyu, to give him the title he assumed when he qualified as Honorary Honinbo last year, made a good start in the 72nd Honinjbo title match. The challenger is Motoki Katsuya 8P, who, at 21, is six years Iyama’s junior and is the third-youngest challenger ever. If he were to win, he would be the youngest tournament Honinbo. thought that White’s profit was slightly superior. This was apparently Motoki’s own opinion. Soon after, Iyama started a large-scale fight with the support of his ponnuki in the background. Motoki went wrong with White 84. Ironically, this move looked like good style but actually gave Black the chance to strike at a vital point. A white group under attack managed to live, but Black took the lead. Iyama’s endgame was then flawless, so an early resignation was unavoidable. This was a tough title-match baptism for Motoki, but at least he had a chance to get used to the atmosphere of two-day games. The second game was scheduled to be played on May 23 & 24. Once again, Japan was beaten by Korea and China, but there were some encouraging signs. On the top board, Fujisawa Rina had a good game against Che Cheong 7P of Korea, but missed her opportunities to wrap up the game. In the end, she lost by 1.5 points. Xie Yimin hasn’t delivered for Japan in international go, but she won her games against Lu Jia 2P of China and Zhang Kaixing 5P of Chinese Taipei. The third member of the Japanese team was Nyu Eiko 1P, who beat Zhang Zhengping 3P of Chinese Taipei. (3-2), and Kono Rin 9P (3-2). Iyama will play Yamashita in June and Murakawa in July. (May 11) Sakai Hideyuki 8P (W) beat Ko Iso 8P by 4.5 points. (May 18) Iyama Yuta (W) beat Cho U 9P by resig.